Two months ago Twitter acquired “MoPub” an advertising solutions business for a whopping US $ 350,000,000 and continuing on this rampage their new partners are now Truecaller. Truecaller is a global phone directory application for Smartphones which enables users to know their caller which is accessible via the app and website. Developed by True Software Scandinavia AB, this app has an integrated caller ID service using Crowdsourcing to achieve its data along with social media integration for pictures. The application gets its name as it displays the caller’s true name. This global app was initially launched on the Symbian and Windows platform and six months later it was then introduced on the Apple and Android platforms. 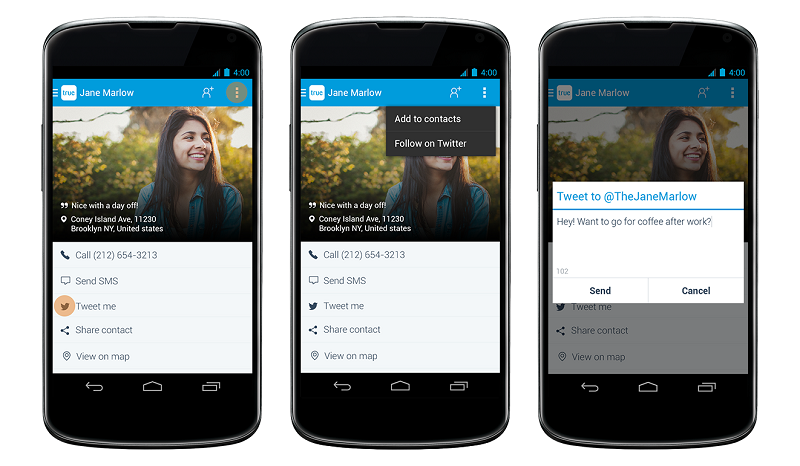 We just tweeted to ourselves from the new #Truecaller app. Awesome! With this latest acquisition, twitter hopes to now connect users through the Truecaller app. So apart from viewing the person’s contact details, name and photo, you can also now view their Twitter profile and even send across a tweet. You may be able to follow and tweet on this app, but as of now your ability to comment on someone else’s tweet or see their full timeline isn’t available. After the partnership, Shah Rukh Khan can also be found for Android users that have upgraded to Truecaller 4.0 with Twitter integration. Users will easily be able to search for Shah Rukh’s Twitter handle, @iamsrk, in the Truecaller search bar, and by calling his free ZipDial number, users without Twitter access will automatically be able to keep up with Shah Rukh Khan’s latest tweets directly through SMS. Truecaller already has a very strong foothold within the country with over 22 million users in the country which is just one third of the total smartphone users. This integration will be available on android platforms initially while Apple and the other platforms will have to wait till sometime in 2014. While Twitter users are content with the privacy and blocking features, on the other hand, Truecaller has a need to drive an extra set of goodwill towards the Indian users, ever since the recent reports that claimed that the caller database was hacked by the Syrian Electronic Army. It was alleged that a lot of private information was left exposed although Truecaller says that it was just the tokens that were exposed. Gradually things are changing for Twitter and this move undermines the progression that has been on an upward move since last year. In the emerging market and competitive scenario the current economy shows, India is a symbol of promising growth and presence. With over 800 million mobile users India stands as a multi lingual country, but with one of its default languages being English. Keeping this in mind, the truecaller and twitter union will only get the masses closer and connected at a more personal level. Alan Mamedi, the CEO and Co-founder of Truecaller stated that “We are aiming for a global roll out soon and looking are looking forward to bring this great experience to the whole world.” But he declined to share a plan as to which country is next to acquire this integrated combination but other countries are definitely on the agenda.